Silicon Knights President: "Gameplay Isn't Everything"
Denis Dyack, founder and president of Too Human developer Silicon Knights, expressed an unusual opinion at the 2009 Develop Conference, telling attendees that "gameplay is not everything." Dyack touched on the work of early Italian film theorist Ricciotto Canudo, who wrote that movies were the "Seventh Art," following architecture, sculpture, painting, music, poetry and dance, and said games should be considered the "Eighth Art." "Canudo argued that cinema incorporated the distinctive elements of both the spatial arts (architecture, painting) with the temporal arts (music and dance)," Dyack said. "In a similar way video games synthesize architecture, sculpture and painting with music, dancing and painting, utilizing elements of each but adding interactivity to move art on to its eighth form." 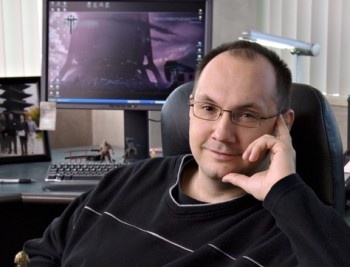 Dyack also said he believes developers should continue to move toward incorporating film industry techniques into their games. "I would encourage us to apply filmic technique to our creations. If you can replicate these techniques extraordinarily well, the your game will resonate with people on a deep level," he said. "It's an unpopular viewpoint, but I don't believe that gameplay is the most important aspect to games," Dyack explained. "I have a theory: That engagement is greater than or equal to art plus story plus gameplay plus audio plus technology. It's all of these things combined, and one is not more important than another." "If you look at the most popular games today, they are far more narrative-focused," he said. "If games are to follow the trajectory of films, then the dominance of gameplay will diminish in place of an increased focus and importance on gaming's stories and the ways in which they are told."